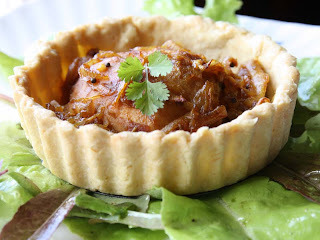 I know I could have just eaten these fuzzy peaches au naturale; or cooked in a sweet tart or crumble, but I was both curious and up for a challenge to try a Anglo-Indian recipe called 'Curried Peach Tartlets' that I had seen in one of my cookbooks. Please note, these are not authentic in anyway, well not that I know of, but it was interesting culinary experience nonetheless. The aroma was very reminisce of ready made curry powder which for me was a little off putting, as I don't tend use curry powder that often in my cooking. The mellow flavour also reminded me of sweet mango chutney. This was okay but my preference is for mango pickle, rather than pulpy,smooth chutney - but that's the South Asian girl in me. I also have to admit that I was not that keen on the cooked texture of the peaches. If I were to make a version of these again, I would probably replace the peaches with under ripe and sharp mangoes. 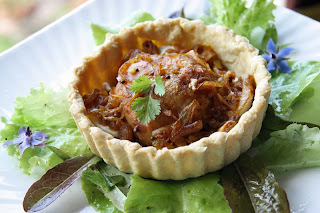 D was far more accepting of these 'Curried Peach Tartlets' then me. His only criticism, he thought there was too much pastry. He suggested perhaps removing the fluted pastry sides, as the pastry base would have sufficed. I actually agree with him. If I haven't put you off trying these, I have another word of warning. 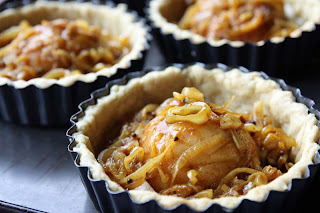 Unlike most of my recipes that offer home cooks some ease, these are a little time consuming as you have to make as made shortcrust pastry from scratch, and then line 6 individual tartlet tins and so on. Still I would encourage you to try them, as your tastes are bound to be different from mine and you may appreciate these more than I did. I served these simply with some home grown salad leaves. I am submitting this to Susan of The Well-Seasoned Cook who is hosting August edition of Veggie/Fruit of the Month which is Peaches. This is a vegetarian event created by Priya of Mharo Rajastan's Recipes. I am also linking this post to Wendy's blog Greenish thumb as I want to share my homegrown salad leaves and borage flowers; as well as This Weeks Craving: Peaches hosted by Mom's Crazy Cooking. Sift the flour. Rub in the butter. Beat in the egg yolks and enough water to mix well Combine the flour to make a soft dough. Knead briefly, then rest fro at least 30 minutes in cool place wrapped in clingfilm or greaseproof paper. Roll out pastry and line 6 individual tartlet tins. Trim the excess pastry and blind bake for 15 – 20 minutes. Heat oil in a wide pan with a lid, then add the mustard seeds until they pop, then stir in the rest of the spices (except for the garam masala) and cook for a minute, before stirring in the shallots and garlic. Cook until tender. Pour the vegetable stock into the pan, add the garam masala and stir well. Add the peaches, cut side down. Simmer spooning the curry mixture over the peaches, for about 6 – 8 minutes. Then using a slotted spoon, remove the peaches and set on a plate. Cook the sauce until it has thickened. Turn heat off. In the pastry tartlets, place a generous layer of goats cheese in the base of each, top with a peach half, cut side down and spoon over the curry sauce. Return to the oven to warm through for 10 - 15 minutes. Remove from the tins and serve. Adapted from Neither Fish Nor Fowl by Sarah Beattie. These look beautiful on presentation, but like D, I think I would forgo some if not all of the pastry. Would you think this would be lovely in a low baking dish, all the peach sisters hugging up to each other with the goat cheese underneath covered with the aromatic topping? When peaches are ready here...will give this one a try..sans pastry. I am honestly delighted to read that you like these. Its really lovely to hear from you. And good to read you are back in blogger land. I would personally recommend having a pastry base, and D agreed with me too, but do try it without if you wish. I like how you described 'all the peach sisters hugging up to each other'. I hope you enjoy your variation whenever you make it. I can't imagine anything more wonderful than a savory peach and goat cheese combination like this. Your photos are amazing. I am completely drawn in by them. Thanks so much for taking the time to stop by and comment on my blog. I am going to be following along with you over here. I have enjoyed my visit. Have a wonderful weekend! I have never tasted peaches in curry. So... I can't wait to try it! Must be something! I will pass your lovely compliments about the photos to my husband. He takes most of them, and these have been taken by him. I really hope you enjoy it when you make your version of this dish. hmmm, I love curry, I love tarts, and I love peaches (just picked up a bunch at the farmer's market this morning). I should give it a try. But when you mentioned the crumble...yuuuum. Peachy crumble sounds yum. I've picked up some plums from the farmers market...Crumble here too..maybe. Curried peaches was new to me too, until I came across it in this book. It was interesitng, but not a dish I'll make again in a hurry. Well they certainly look very pretty and the ingredients sound as though they would taste good, but I can imagaine the peachy texture being a little odd. Yes the texture for me was the main issue, but they were perfectly edible. I'm the world's worst pastry-maker. Just cannot get it to come out right. But I wonder if the curried peach filling wouldn't make an interesting side dish all by itself (no pastry, no goat cheese)? I'd encoruage you to keep trying with the pastry making. I'm not great at all, but I do look making my own when I can. Certainly superior than supermarket variety. Yes, I think it would be good as a side dish. I can see it goign well with baked potatoes. Your peach tarts look devine!! These sound very interesting but I can imagine that they would be nicer with a firmer texture, like you suggested with using mangos. Very intriguing! Firmer texture would def. be better.